Muscles in your eyelids control the movement of your lids, and if you have a spasm in one of these muscles, you might experience an eyelid twitch. If this occurs, you might feel your eyelid twitch uncontrollably, but observers cannot usually detect the twitch. Spasms in your eyelid do not usually indicate a serious problem. 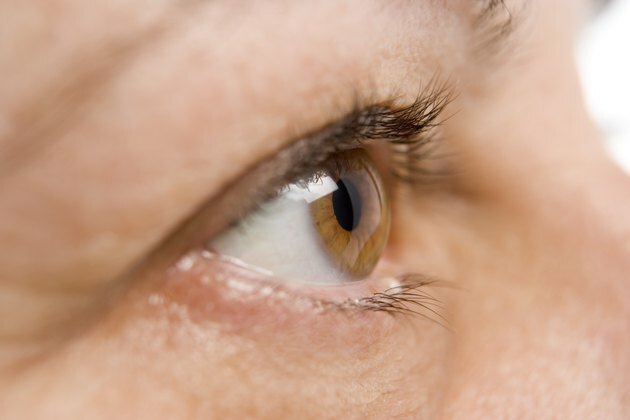 Although certain factors might play a role in eyelid twitching, potassium does not have a known connection to the condition. Eyelid twitches commonly occur from lack of sleep and stress, but you might have twitching if you drink too much caffeine, consume alcohol or smoke. In addition to these potential causes, low levels of magnesium could result in twitching because this nutrient plays a vital role in muscle function. Potassium, however, does not have a similar effect on the body and eyelid muscles. Your body requires potassium to help conduct electrical impulses throughout your body. This keeps your heart and other vital systems functioning properly. The average adult needs around 4,700 mg of potassium daily to perform necessary functions. You can find this in foods such as bananas, which provide more than 400 mg, or lima beans, which offer 485 mg for a half-cup serving. Unlike a magnesium deficiency, low levels of potassium do not result in muscle spasms. Instead, a potassium deficiency might result in muscle symptoms such as weakness, cramping or paralysis. In most cases, you will not require treatment for your eyelid twitches. These typically resolve themselves within a few days, but a spasm might take up to three weeks to disappear. If you experience a spasm that causes your eyelid to close completely, or if you have spasms in your face and other parts of your body, contact your doctor immediately. Similarly, changes in vision or comfort associated with twitches also require prompt treatment. If you suspect you have low potassium levels, talk with your doctor. She will test your blood, and if you show a deficiency, she might recommend that you take a daily supplement. You should not begin using high doses of potassium or other nutrients without first talking to your doctor because this could react with medications or medical problems you already have. Does Too Much Vitamin D Cause Eye Twitching?